The center of town is toward Public Square. The center of the Earth is always down. The center of our solar system moves from east to west every waking day. The center of our galaxy is toward its black hole in Sagittarius. But, the center of our universe is … everywhere! The scientific method runs from observing the physical world, to making a theory that describes and predicts its behavior, to testing the prediction. The best theory accounts for the most behavior in the simplest terms. Albert Einstein brought forth the theory of general relativity, and defined it with ten mathematical equations. But, he found that he could simplify to one equation with the assumption that, in the long view, the universe is the same everywhere — without much variation, without direction, without a single center. That assumption is called the cosmological principal. Further observation has borne out the cosmological principal. Looking up in any direction, we find the same types of galaxies, which are bunched into galactic clusters, which are strung into superclusters. As we look further out, we look further back in time. To the Sun we look back eight minutes — the time it takes light to travel from there to Earth. To the center of our galaxy, we look back 26,000 years; to the next nearest major galaxy (Andromeda), 2.3 million years; to the nearest large galactic cluster (Virgo), 52 million years; to the next nearest large supercluster (Centaurus) 140 million years. And to the furthest point we can see, we look back 13.7 billion years — just 380,000 years after the Hot Big Bang. That furthest point is at the Cosmic Microwave Background (CMB). We find the CMB in every direction up. And its heat map is without much variation — in fact, it is 99.999% uniform. From any other galaxy in the universe, an observer that looked up would see virtually the same picture that we do. What lies beyond and back in time before the CMB we cannot directly see, because the universe was then opaque. But the CMB, by its very presence, and the intensities of energy over its frequency spectrum, fulfills predictions of the Big Bang Theory — the current standard model of the universe. So we know that there was a Hot Big Bang — when the universe was extremely hot, dense, and rapidly expanding. And by its highly-uniform heat map, the tiny temperature variations across the heat map, and the imprint of gravity waves in the heat map’s variations, the CMB fulfills predictions of Cosmic Inflation Theory. So, though we await confirmation of the gravity waves finding, which was just announced this year, it is now likely that our universe’s region of space inflated — stretched from sub-atomic size to macro size in a split instant. As inflation ended, much of its expansion energy may have changed into particles, changing the universe from extremely cold and empty with accelerating expansion to extremely hot and dense with decelerating expansion, and feeding into the Hot Big Bang. Big Bang: Some take “Big Bang” to mean the Hot Big Bang, some the onset of Cosmic Inflation, and some Time 0 — the very beginning of everything. 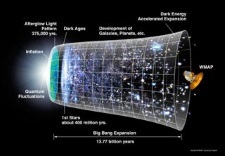 The Hot Big Bang has heat and rapid expansion. The onset of Cosmic Inflation is cold, but has screamingly rapid expansion. But Time 0 is unknown. Rather than a big bang, it may be a wee whisper. Parallel universes. Quantum leaps between times – a la “Back to the Future.” Thanks for the lucid description of why these concepts work.